On Aug. 21, cliff divers in McMinnville, Oregon dove into a water tank against the backdrop of the solar eclipse. A group of cliff divers created their own celestial spectacle today (Aug. 21) in McMinnville, Oregon, by diving into a tank of water in the darkness of the solar eclipse. In this photo, it appears as though the diving Helena Merten, of Australia, were pushing the moon farther along its path across the sun. Along with Merten and Colturi, two other divers from the Red Bull Cliff Diving team — Andy Jones, of the United States, and Orlando Duque, from Colombia — dove from a height of 65.5 feet (20 meters) into a 30,000-gallon (113,562 liters) tank of water, which didn't seem as big to Colturi as it may sound. He and his fellow cliff divers ordinarily take off from a bigger area — from a cliff or a building — and into open water that is both deeper and wider, according to Colturi. But the constraints imposed by diving into a tank in a field weren't the only challenges the team faced during this dive. There was also the darkness to contend with, punctuated by the photographer's flashing lights. 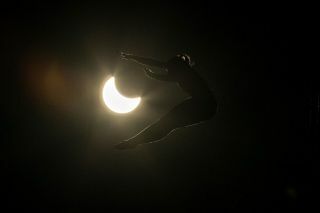 A cliff diver plunges toward a water tank against the backdrop of the solar eclipse in McMinnville, Oregon. "There was a lot going on, and it's a little bit challenging to just kind of focus on the dive and hitting your positions and doing it safely. But thankfully, we all kept it together, and all four of us hit some really cool positions and great dives," Colturi said. In other photos, the divers can be seen in silhouette or blasted with artificial light doing what they do best: falling with grace in what looks like a sort of yoga in the sky. It wasn't easy for photographer Dustin Snipes to capture such stunning shots. "I was so excited, I was literally shaking," he said in a statement. To make the subjects appear as close to the sun as they seem to be in the photos, Snipes had to time the position of the divers' descents with the correct angle of reflection of the sun's path in a set of high-optical quality front-surface mirrors, the type of mirrors used in microscopes and telescopes. "And it came out to be this incredible, magical experience," Colturi said. "Afterwards, we kind of took a second to just [think], 'Whoa, did that really happen?'" The Red Bull Cliff Diving athletes take to the skies next at Hell's Gate cliffs in Possum Kingdom Lake, in Texas, on Sept. 3.